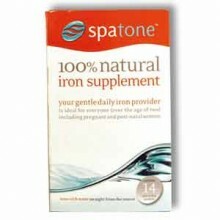 One sachet of Spatone, or up to two during pregnancy, should fulfil your daily requirement for iron. Not suitable for for children under 2 years old. Natural water with a high content of iron sulphate directly from source at Trefriw Wells Spa in Snowdonia, North Wales. Contains 5mg Iron per sachet, nothing else added. This iron is naturally in water, so it's easily and gently absorbed by your body. It should not cause certain side effects (stomach irritaion and constipation) associated with high supplemental iron intake. Click the button below to add the Spatone Natural Iron Supplement 14x20ml sachets to your wish list.